Hard to believe that it’s been a decade since Galway was treated to B&Q — the massive store at the Gateway Retail Park in Knocknacarra celebrates its tenth birthday next weekend, and every visit makes you realise what a moveable feast this amazing store is. Every week, there is something new happening, some fabulous offer, some new service, some gem. There is so much energy here every week, that most people do not realise just how good it is at providing a comprehensive home improvement service. As one of the biggest stores in the region, it has an evolving nature that means no two visits are the same; once you go through the door, you inhale the atmosphere of whatever season is approaching, whether it be Halloween or Christmas or Springtime, you are assailed by an array of services that makes you want to make your home more beautiful. Where else can you get a design consultant to provide you with a 3D impression of what your new kitchen or bathroom will look like? They will guide you through the process to make your home the home of your dreams - and a groundbreaking software application can now allow you to do this afterwards from the comfort of your home. It is something the company has invested millions in, and it revolutionises the whole process of selecting a kitchen. Eventually it will rollout through all the many departments in this massive store, so that customers will be able to visualise just how their homes will look with the addition of B&Q products. And there’s much more — As exclusive stockists in Ireland of the fantastic Valspar range of paints, B&Q Galway can mix over 2.4 million colours, so there isn’t any shade that they cannot provide you with. It has to be seen to be believed. The lighting range is one of the most contemporary in the country — and with even more exciting new trends arriving soon, you can make sure that the latest in lighting technology becomes a feature in your home this season. At the moment, the store has a massive Christmas section, with everything you need for festive decor available at the best prices, while for the DIY enthusiast, the offers on power tools have to be seen to be believed. Your head will spin at all that is available at B&Q Galway as they approach their tenth birthday next week. Paul Molloy from Renmore has been there from the first day, as he was the first employee through the doors. “It was just one big empty shell when I started but over five months, we transformed it into the 60,000 sq ft we have today, employing 51 people, many of whom are here from that time,” he tells me. “I had come from the retail sector, but this was mind-blowing. “This is the kind of building that is worth coming to visit once a week if nothing else, even if you don’t buy anything, because there are always offers on that aren’t advertised, so it is a store that you need to actively keep in touch with, because that is the secret of B&Q. “Also because we are always on trend, we can offer the highest quality at the lowest prices. Trends are what we live and breathe by. When our customers come in now, they have their research done and are well versed on what they want, and we have to be able to meet that standard, and we do,” he says. General manager Nick Friel says that customers who come into B&Q have an expectation of quality in the products and in the services and the staff strive to deliver that. “Our core business is being a DIY expert and home improvement store and we specialise in our seasonality. Our spring, our summer, our winter, and our Christmas. Everything is unique to the season. It’s winter now, so we have Christmas and also we supply home heating solutions, and great offers on fuel and we offer a delivery service,” he says, as he looks forward to marking a decade of this amazing store. The building department and the garden centre also offer strong example of how you can make substantial changes to your home, both internally and externally, with the help of the B&Q expertise and products being provided by one of the top hardware suppliers in the world. 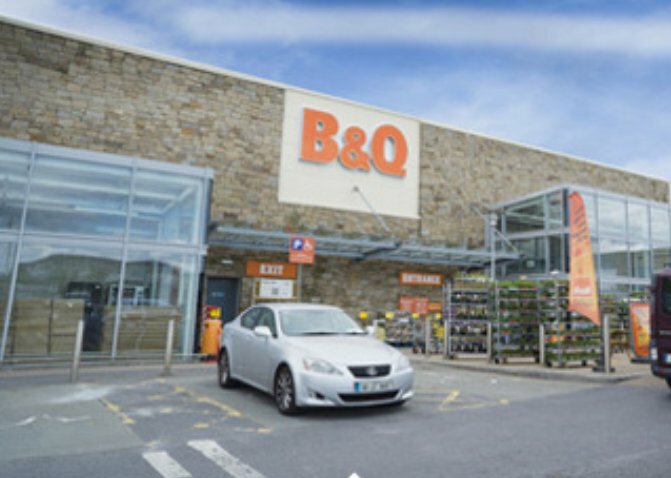 B&Q Galway is a member of the Kingfisher Group — which operates more than 1,200 stores and growing omnichannel operations across 10 countries in Europe. They employ 77,000 people and nearly six million customers shop in their stores and through their digital channels every week. This means that B&Q Galway, as part of the third biggest retail chain in the world, has access to the latest trends in kitchens, bathrooms, flooring, tiling, lighting, compiling a stock of products that will meet the requirements of even the most discerning customer. On every aisle, there is an expert. Because its staff span age ranges and carry so much expertise, B&Q is a massive store with a family feeling. Customers feel at ease asking questions, just as they would have in the traditional small-town hardware stores of their youth. Next weekend, the Gateway Retail Park will be marking the tenth birthday with a day of events. Huge crowds are set to enjoy a unique children’s Spooks Parade and family fun day to kick off the Halloween season at Gateway Retail Park on Saturday, October 28. As well as Count Dracula and his spooky entourage, kids will be entertained by magicians, jugglers and face painters with a Halloween DJ providing suitable ghoulish tunes. And as usual B&Q Galway will have more fantastic offers. Get along and bring the family and be entertained and enthralled by the team at this super store that has played a central role in Galway life for a decade.